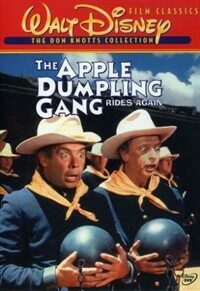 There's more trouble afoot as The Apple Dumpling Gang (Don Knotts and Tim Conway) can't stop causing trouble -- and laughs -- even when they give up their life of crime! First the ditsy duo is accused of bank robbery as they try to deposit a check. Then they join the U.S. Cavalry and wind up in the stockade for inadvertently blowing up their fort. Although they escape this mess, the witless team who could never shoot straight still can't seem to succeed in going straight. It's riotous, raucous fun as THE APPLE DUMPLING GANG RIDES AGAIN!|One modern reviewer describes stars Tim Conway and Don Knotts as "Dumb and Dumber decades before Jim Carrey and Jeff Daniels. "|Part of the movie was filmed at the Kanab Movie Fort, in Kane County, Utah, which first became a movie set in 1922. More than 100 films and commercials have been shot on location in and around Kanab, earning Kane County the nickname "Little Hollywood."